Chamber Music at the Clark concert seating is determined via lottery. The booking-by-lottery entry form for Tesla Quartet seats posts here on Thursday, March 23, 2017. Lottery registration closes Thursday, April 13, 2017. 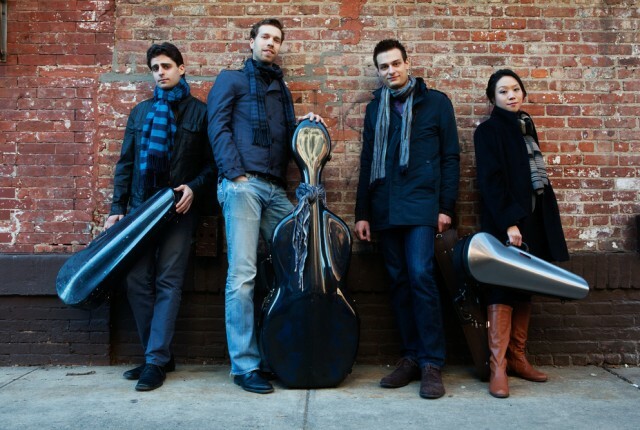 The Tesla Quartet was formed at the Juilliard School in 2008 and quickly established itself as one of the most promising young ensembles in New York, winning Second Prize at the J. C. Arriaga Chamber Music Competition only a few months after its inception. From 2009 to 2012 the quartet held a fellowship as the Graduate String Quartet-in-Residence at the University of Colorado-Boulder, where it studied with the world-renowned Takács Quartet. The musicians have studied at the Chamber Music Residency of the Banff Centre and have also worked with Günter Pichler and Rainer Schmidt in ProQuartet-CEMC’s professional training program in France. Additional coaches include the Tokyo String Quartet, Artis Quartet, Mark Steinberg, and Sylvia Rosenberg. In the summer of 2011 the quartet held a fellowship at the Norfolk Chamber Music Festival, and in 2010 the members were fellows at the Aspen Music Festival’s Center for Advanced Quartet Studies. David Kaplan, pianist, has been called “excellent and adventurous” by The New York Times and praised by the Boston Globe for “grace and fire” at the keyboard. He has appeared at London’s Barbican Centre and Miami’s Arscht Center with Itzhak Perlman; he has also worked with the Orpheus Chamber Orchestra. Recent recital appearances include the Ravinia Festival, Sarasota Opera House, and National Gallery, and he looks forward to appearances at Music on Main in Vancouver and Strathmore’s Music at the Mansion in Baltimore. An avid concerto soloist who often conducts from the keyboard, he recently performed Schumann’s Piano Concerto with the Johnstown Symphony and James Blachly, and the De Falla Harpsichord Concerto at the Mondavi Center in Davis, California. David Kaplan is also a lecturer in the Department of Music, UCLA Herb Alpert School of Music.